The Theta-Zeta Chapter Executive Committee is happy announce the details for our 2017 Black & White celebration! 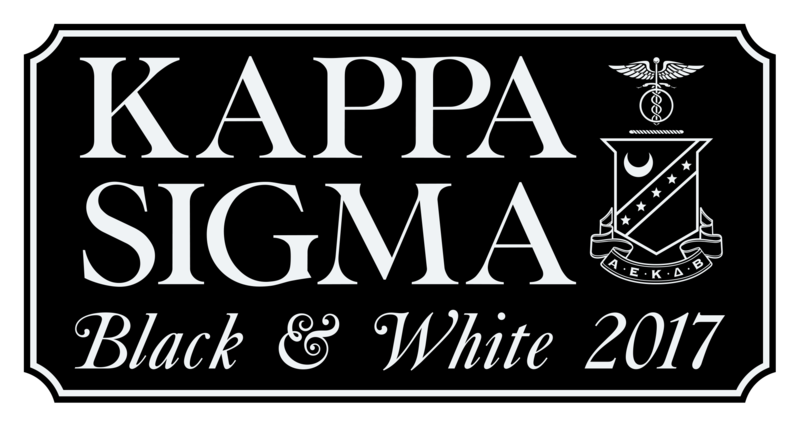 Please visit our Black & White page (thetazeta.org/black-white) for more details, and to reserve your spot today! We are saddened to learn that our brother Andy Stoddard has joined the Chapter Celestial. We extended our thoughts and prayers to his family, friends, and all our Brothers who knew him. We are honored to post the following video, featuring Past Worthy Grand Master Kevin Kaplan providing brother Stoddard’s eulogy. The Theta-Zeta Chapter is proud to announce the winners of our 2016 Cowdrop fundraiser! Congratulations to the winners, and thank you for participating this year! Recently our Chapter was featured on the local news for our recent contribution to the ENMU Stadium project. Grand Master Tyler Herring and Grand Master of Ceremonies Joshua Salazar gave an interview with KRQE News 13 and spoke on how proud they are to help support our ENMU Athletics, and their own excitement for the stadium. 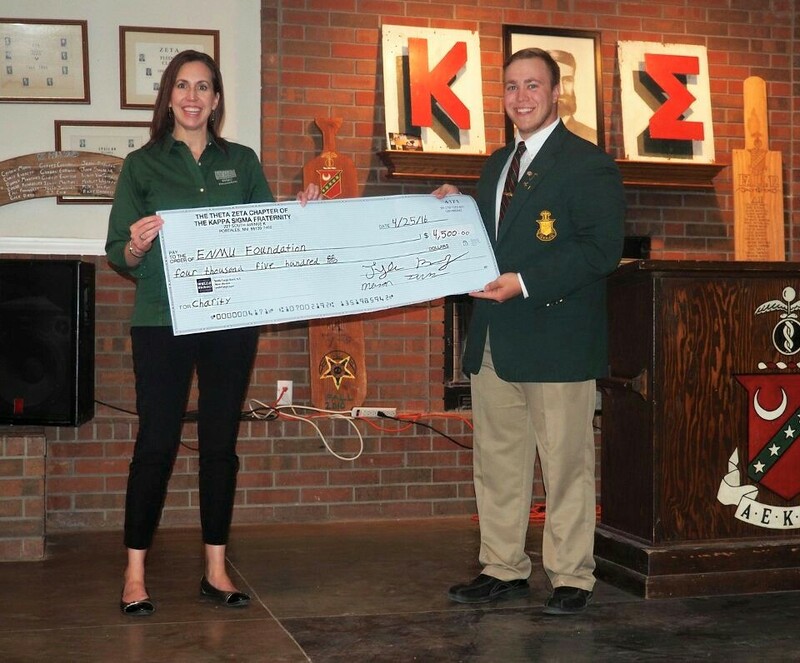 We were able to donate $2,500, proceeds from your donations to our Cowdrop fundraiser, given to the ENMU Foundation. We invite you to contact us to learn more, and take a look at the original KRQE article and video. The Theta-Zeta for Life initiative has awarded 16 brothers with scholarships for those who met the requirements for fall 2015. More details are available on the Theta-Zeta for Life page, but in short, these brothers had both a great academic achievements, and contributed to the Chapter in an impactful way. In an email sent out earlier this month to alumni, these brothers expressed their gratitude for receiving these awards. We decided to share select quotes below. To request the full PDF, please contact us. I would like to thank all of you that donated your own hard earned money towards the Theta Zeta for Life Scholarship. It is an honor to have been awarded this scholarship and I hope to keep representing this chapter in the best way in which I am capable. Truthfully, if this scholarship did not exist, there is a good chance that I would not have stayed around due to financial reasons. So I would once again like to thank every one of you for giving me the opportunity to be a part of something bigger and greater than just myself. I just want to say thank you to the supporters of this scholarship, you’ve made it easy on me during this time where I have had difficulty finding a job and made my time with the fraternity a little less stressful. 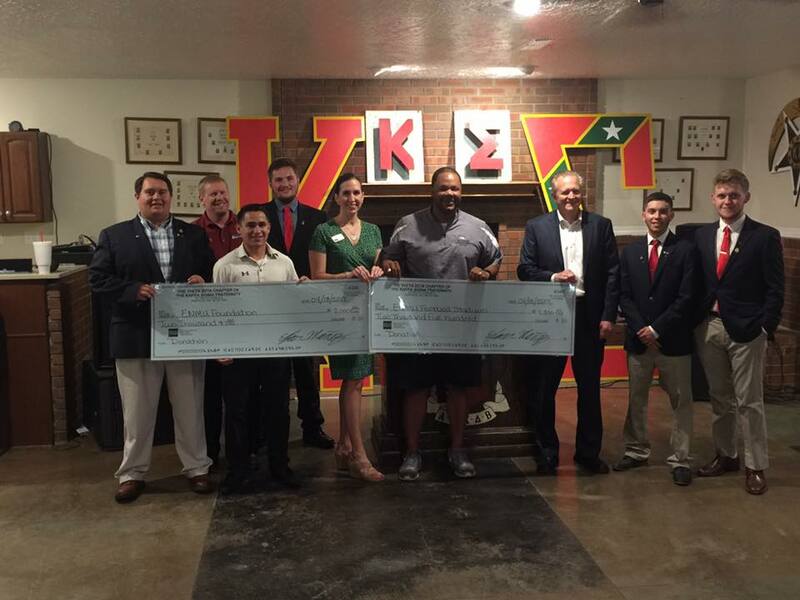 I hope this scholarship encourages and helps more brothers in the fraternity. I received the Theta-Zeta for life scholarship for this Spring 2016 semester and it helped alleviate many problems for me. As a student athlete it is extremely hard to get a job that is willing to work around my hectic baseball, school and fraternal schedule. Having 6 months of my dues paid for allows me to focus on other things like helping the chapter out with brothers getting certificates and helping mold some of the young actives into leaders and help them mature and grow as men all the while doing the same for myself. I would just like to thank all of you for your contributions to our chapter and helping make our lives as college students that much easier. I’ve always had family cover for fraternity expenses, [and] this scholarship affords me extra housing funds in place of that luxury. We wish to thank our Alumni brothers for another successful Homecoming! Should you want a higher-quality picture, please use our Contact Us page and we’ll get one to you. ΑΕΚΔΒ. Brother Bryan D. Frapp was initiated in the spring of 2002, he is a past Grand Master of Ceremonies, Grand Procurator, and Grand Master. He is a Master of the Ritual, Jackson’s Man Pin #1755, Undergraduate Brother of the year and Outstanding Grand Master 2006. Brother Frapp Graduated in 2006 from Eastern, then received his Doctorate of Physical Therapy in 2012 at San Angelo State University. As an Alumnus he has served as Ritual Commissioner and Deputy Commissioner for Colony Development of area 4. He currently resides in Soldotna, Alaska with his wife, Amy, and 7-month old son Cooper. In his career he is currently undergoing Board Certification for Orthopedic Certified Specialist and is practicing Mechanical Diagnosis and Therapy. Brother Robert “Critt” Garner was initiated in the spring of 1967 and was a part of the Iota pledge class. Brother Garner is a former Grand Master of Ceremonies, Social Chairman and helped found the Stardusters (little sisters) program. He was a contributor to the Renaissance Campaign for the recent house renovations. He graduated in 1970 from ENMU and has had a 39-year career in public education, holding multiple positions before retiring.. He currently resides in Las Cruces, and enjoys spending time with his life partner, Sally, two daughters, and two son in-laws.